(1) Our newest Commercial Email Contest Winner is Michael DiMaio, MD, from Marin Medical Labs. A $50 Amazon gift card was sent to Dr. DiMaio. Please make sure to sign up for and read our Commercial Emails for a chance at another contest! There were very low entries in the last contest. Remember, you can't win if you don't enter. (2) We are pleased to announce our new Jobs page, highlighting our extensive collection of Pathologist and pathology related jobs (currently 267 active jobs). The advantages of the new format are faster posting and removal of job ads, faster loading of the Jobs page, and a more uniform format for the Job ads. We have tried to mimic the prior jobs page as much as possible to minimize confusion, but want to highlight these new features...Read more. (3) Congratulations to Dr. Oana C. Rafael, Virginia Commonwealth University, for this winning suggestion about the coolest thing to add to PathologyOutlines.com's website: How about a e-Journal Club? Or a mentorship program, where top / well-known pathologists would directly answer trainees' questions? We plan to start an e-Journal newsletter which goes out every 2-3 months, and highlights important articles selected by one of our editorial board members in his / her specialty. Regarding Mentorship, we are exploring this feature for issues relating to the Career of Pathology, but not regarding specific diagnostic challenges. Read more suggestions. 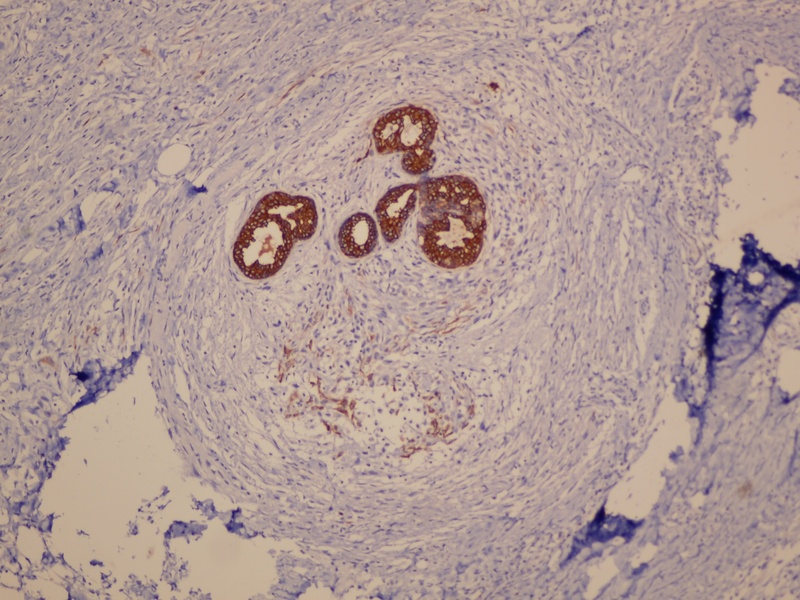 A 60 year old woman presented with a 1 month history of a 3 x 3 cm lump in the upper inner quadrant of the left breast. Fine needle aspiration yielded a low cellularity specimen. 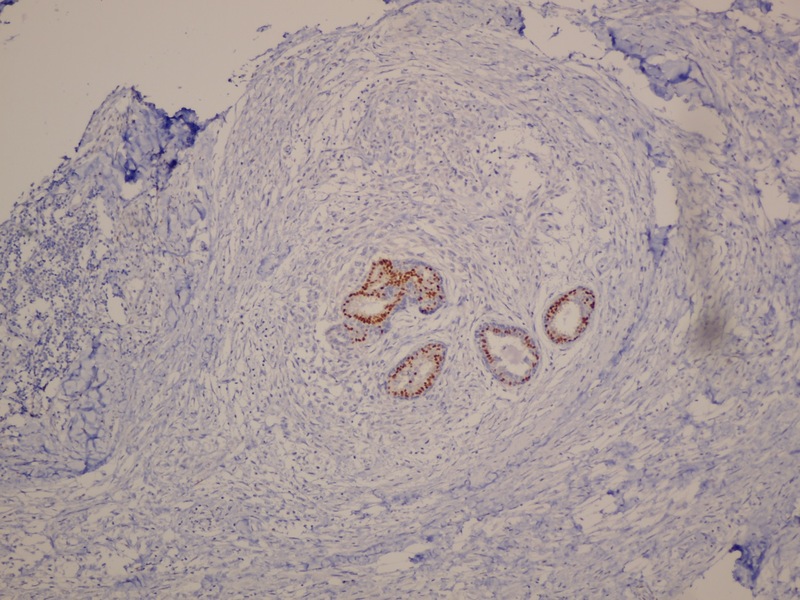 A few clusters of ductal epithelial cells with minimal atypia, not diagnostic of malignancy, were found. Lumpectomy was performed. On gross examination, the lesion was described as a globular mass with a firm consistency and grey-white homogeneous cut surface, surrounded by a thin rim of adipose tissue. 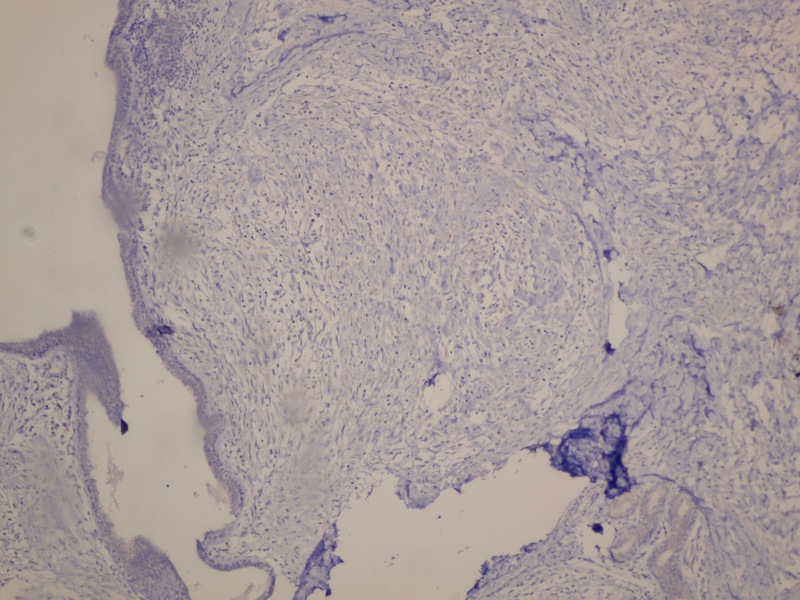 On low power, the interlobular stroma is expanded by a proliferation of atypical spindle cells. The spindle cells are arranged in thick bundles and have an infiltrative growth pattern, entrapping benign ductal elements and adipocytes. 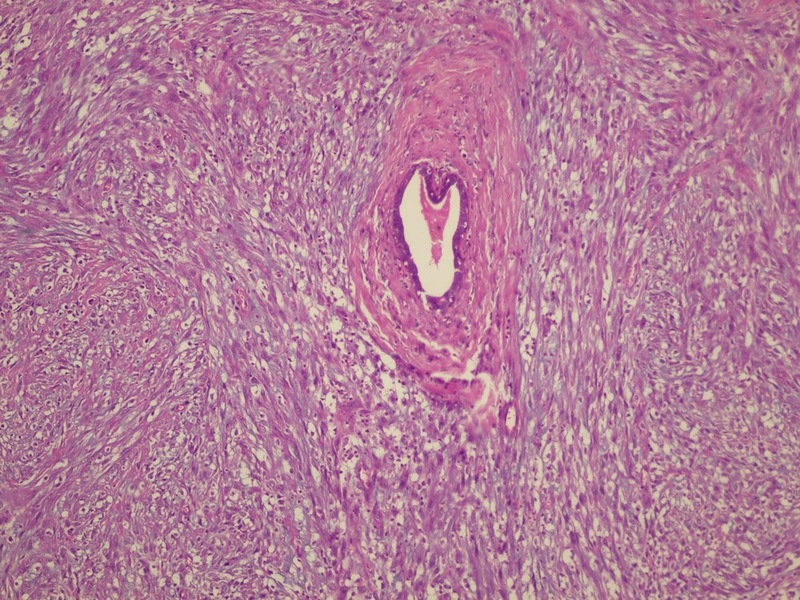 Apart from benign proliferative and non-proliferative changes (mild / non-florid usual ductal hyperplasia, cystic dilatation and apocrine metaplasia), the epithelial component is unremarkable. Focal aggregates of mixed inflammatory cells are also present. On higher power, the spindle cells are mildly-moderately pleomorphic with vesicular nuclei and up to 5-6 mitotic figures per 10 high power fields. 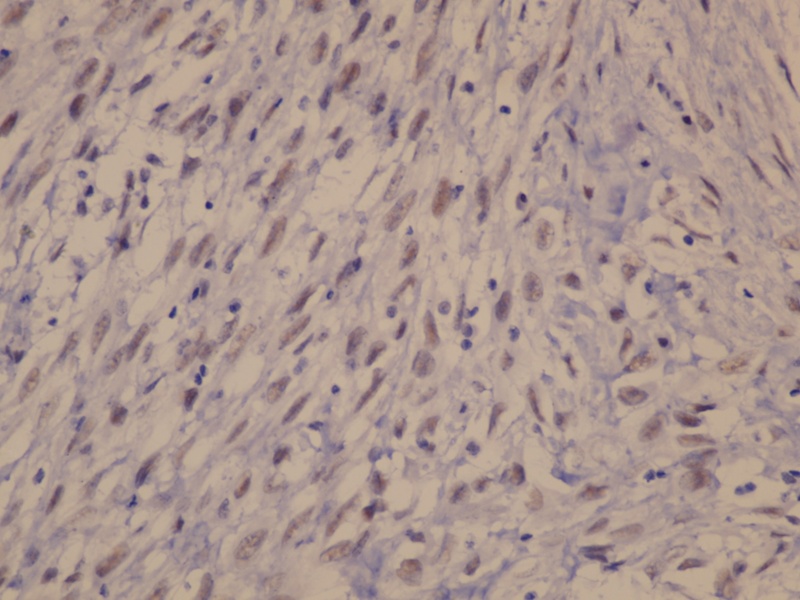 The spindle cells are positive for p63, pan CK and CK 5/6 with weak expression of PR and are negative for ER and HER2. The Ki67 index is high. 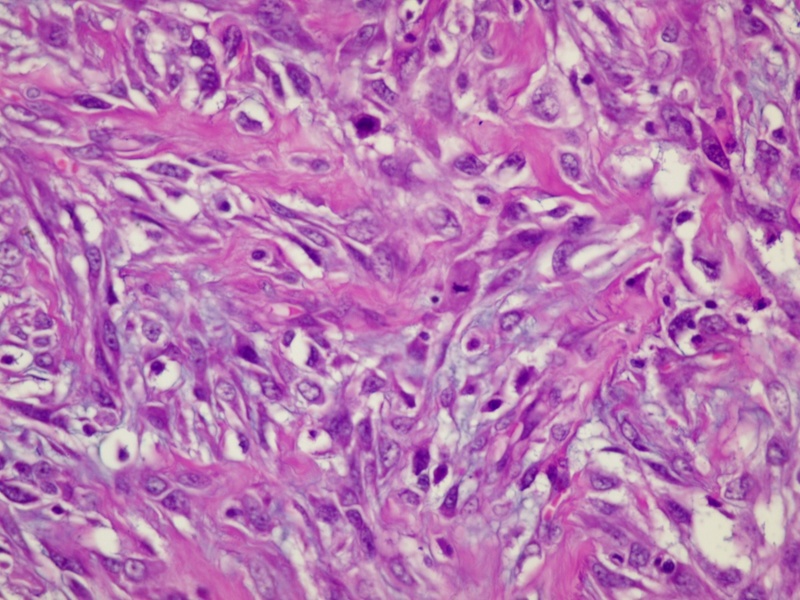 Myoepithelial carcinoma (malignant myoepithelioma) is a rare malignant tumor of the breast composed of moderately to severely atypical mitotically active spindled cells entrapping benign ducts and lobules. 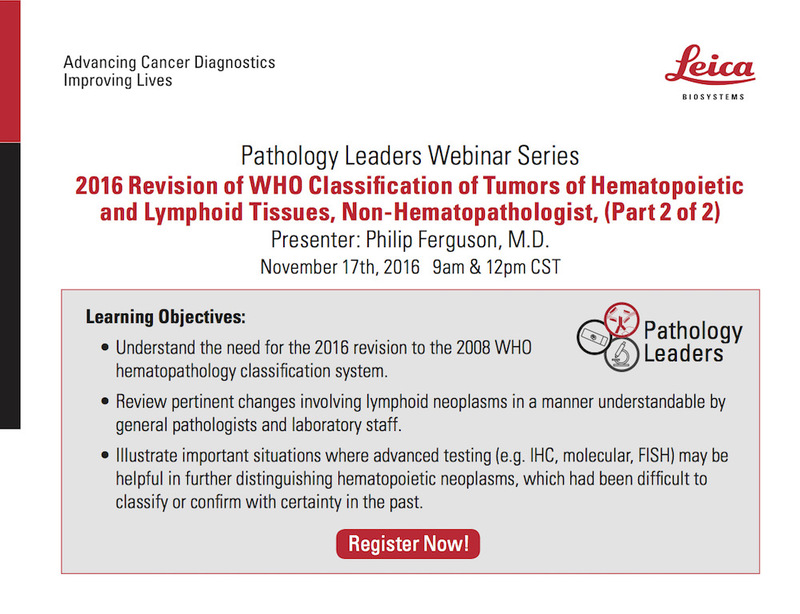 A component of clear or epithelioid cells is often present (Molecular and Clinical Oncology 2016;4:723). Most of these carcinomas are diffusely positive for p63 in combination with focal to diffuse keratin expression (e.g. 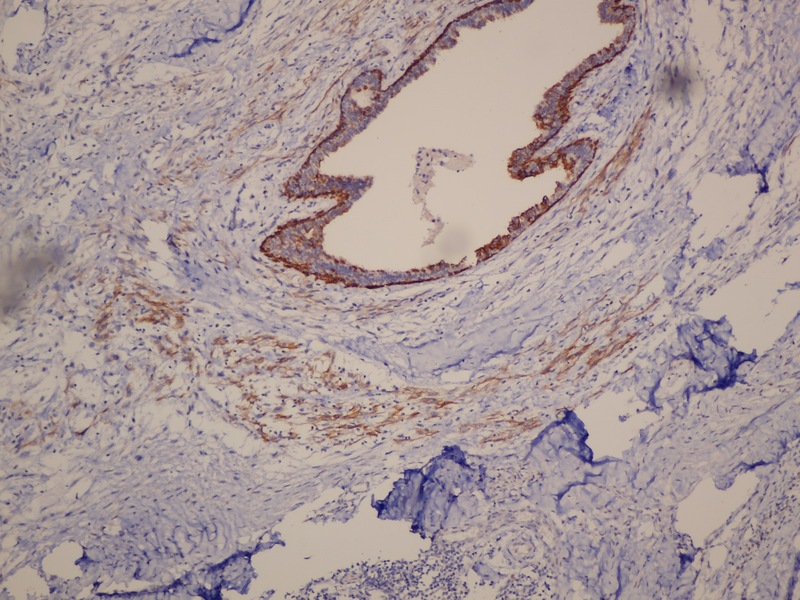 CK903 and CK5/6) and focal weak to diffuse staining for myoepithelial markers (calponin, S100, smooth muscle actin or CD10). The biomarker (ER / PR / HER2) profile is typically triple negative. The genetic profile of myoepithelial carcinoma is distinct from other triple negative carcinomas of the breast. A low number of genetic alterations are seen compared to matched controls of conventional invasive ductal carcinoma. The most common cytogenetic alterations are chromosomal losses (16q, 17p, 11q and 16p). Distinct patterns of MiRNA (micro RNA) expression are noted when compared to normal luminal cells, and the MiRNA profile of myoepithelial carcinoma closely mimics that of metaplastic carcinoma in some studies (Lab Invest 2000;80:831). Malignancies considered to be true myoepithelial carcinomas are also found in the salivary gland, soft tissue and skin. 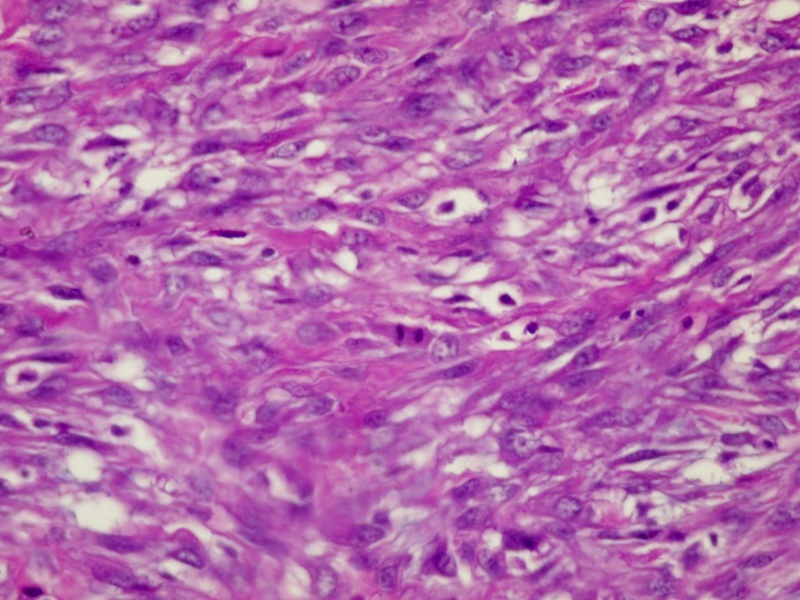 Although the literature relating to management is limited due to the relative scarcity of myoepithelial carcinoma and lack of consensus on the exact defining features (see editor's comment), treatment is primarily surgical (wide local excision or mastectomy) and may include axillary lymph node biopsy or dissection followed by radiation therapy. The role of chemotherapy is not well defined. Prognosis is determined at least in part by stage at presentation and completeness of excision (Case Rep Oncol Med 2013;2013:164761, Breast Care (Basel) 2010;5:246, Eur J Surg Oncol 2004;30:357). 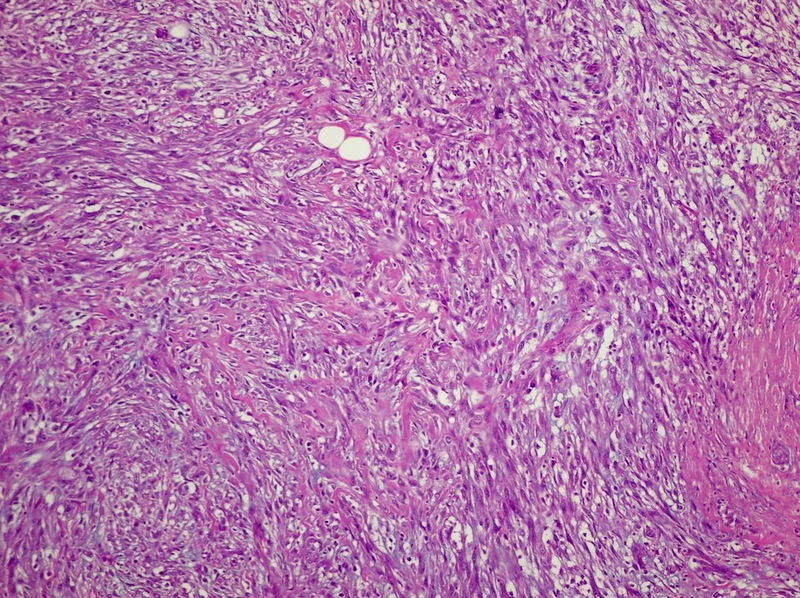 Adenomyoepithelioma: benign to low grade malignant biphasic tumor composed of epithelial and myoepithelial components. Myofibroblastoma: short fascicles of spindled to ovoid myofibroblastic cells interrupted by brightly eosinophilic, dense collagenous stroma, positive for CD34 and myoepithelial markers. 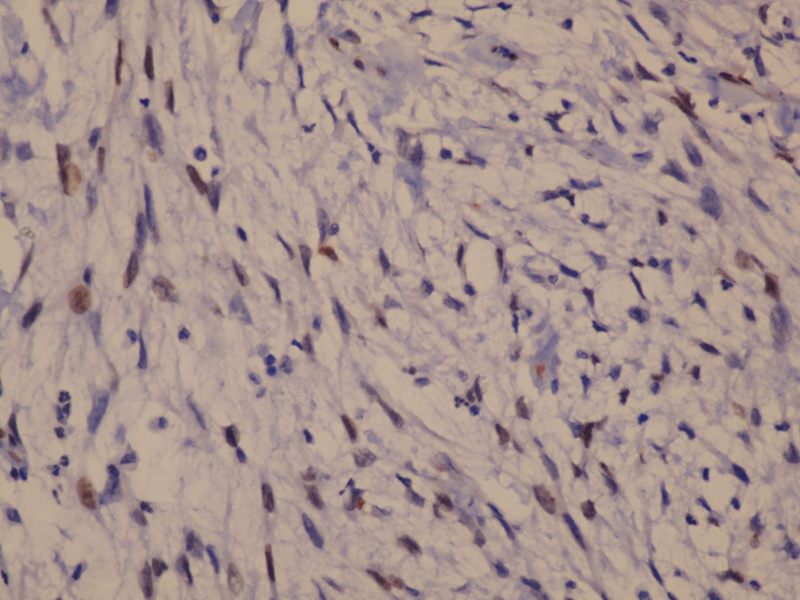 Fibromatosis: poorly circumscribed, variably cellular, long sweeping fascicles of bland spindle cells with infiltrative growth pattern, nuclear positivity for beta-catenin (80%), negative for keratin and CD34. 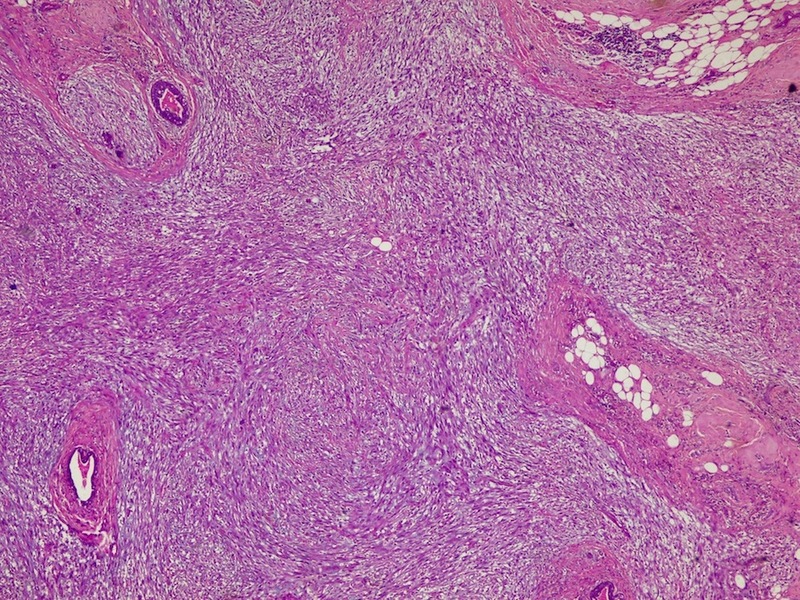 Malignant phyllodes tumor (stromal component): leaf-like growth pattern, other heterologous elements may be present. 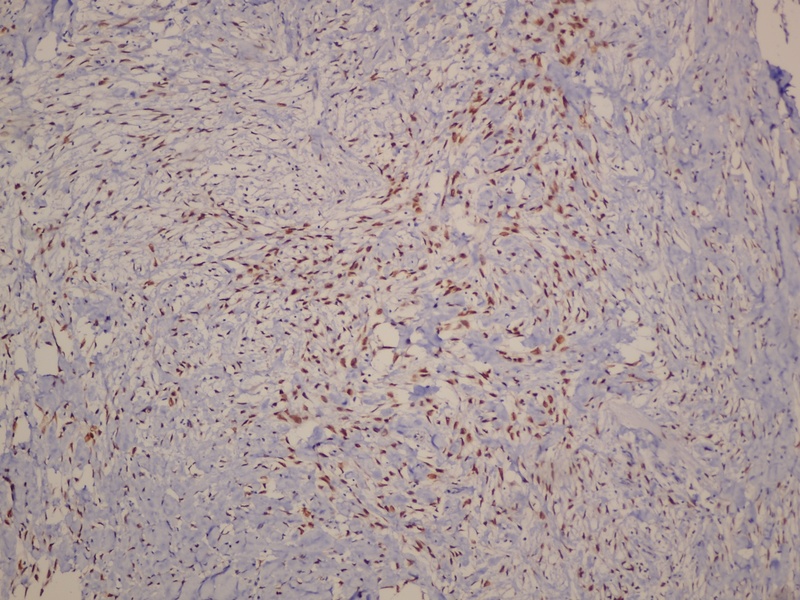 Leiomyosarcoma: intersecting fascicles of spindle cells with eosinophilic cytoplasm and cigar shaped nuclei, positive for EMA, keratin, SMA, desmin and caldesmon. Fibrous histiocytoma: negative for keratins, CD34, desmin and S100, positive for CD68 and SMA. Some experts consider these lesions to fall within the spectrum of spindle cell metaplastic carcinoma, in contrast to others who contend myoepithelial carcinoma is a distinct entity. Although most cases described in the literature also demonstrate myoepithelial differentiation as identified by markers other than p63 (e.g. SMMS-HC, Calponin, SMA, CD10 or even S100) in addition to certain morphologic features (clear or epithelioid cells, the appearance of the carcinoma arising from hyperplastic myoepithelium associated with benign ductal elements), it is not clear if this is required for diagnosis. As there is little difference in prognosis and management, the distinction may not be clinically significant.